This accredited Practitioner course comprehensively covers the ArchiMate 3.0 modeling language and how it can be practically applied when creating enterprise architecture models. Upon completion of this course, students will have gained a thorough knowledge of the terminology, structure and concepts needed to pass the ArchiMate 3.0 exam. Take this accredited ArchiMate 3 training course and equip yourself with the knowledge and skills required to become a certified ArchiMate 3 practitioner. Like ArchiMate 2.1, ArchiMate 3 is a comprehensive modeling language that allows architects to create commonly understood and integrated visualizations of the essential enterprise architecture domains. The course is self-paced, intuitive and engaging, allowing both individuals and teams to build an understanding of the ArchiMate specification in and around their usual routine. Completing the course and sitting the exam will enable the candidate to deploy the ArchiMate specification in an architecture practice, and with an industry-recognized qualification that proves their detailed knowledge and understanding. The course offers 12 months of access, allowing the candidate to design their own study schedule. Also included is a free combined exam voucher! Completing this course leads to a thorough knowledge of the terminology, structure and concepts of the ArchiMate 3.0 Specification, and places the candidate in a position to succeed at the ArchiMate 3.0 exam. As such, students taking this course will have met all of the learning requirements required for ArchiMate 3 certification. Why Study ArchiMate 3.0 With 4PA ? 4PA is an accredited global training provider for ArchiMate. The course is accredited by The Open Group and meets all of the learning requirements required for ArchiMate 3.0 certification. This online training course uses the latest technology to provide students with an interactive and visual learning experience. The course includes audio and video tutorials, interactive lessons and quizzes. The course prepares you for certification by providing in-built practice exams. You can also develop your practical ArchiMate modeling skills with a series of practical exercises set to you by the course. All you need is a laptop and an internet connection. Not only is this course a more flexible, time-convenient alternative to classroom or web-based training, it is a much more cost-effective and scalable training solution. It is also closely linked to and aligned with the TOGAF standard. 4PA e-Learning offer fully accredited courses for both TOGAF 9 Foundation and TOGAF 9 Certified levels. But what’s new about ArchiMate 3 and why should you learn it? What is the ArchiMate 3 Specification? The ArchiMate Specification is an Open Group Standard supported by many consulting firms and tool vendors. ArchiMate is a modeling language for enterprise architecture, allowing enterprise architects to visualize, analyze, and describe the relationships among architecture domains with clarity and confidence. Like an architect’s drawing in classic building construction that describes materials, component parts and their relationships, the ArchiMate Specification offers a means of describing the construction and operation of business services. As a common modeling language, ArchiMate enables stakeholders to design, assess and communicate the consequences of design changes within and between domains such as IT systems, information flows and technical and physical infrastructure. Completing this course leads to a thorough knowledge of the terminology, structure and concepts of the ArchiMate 3.0 Specification, and places the candidate in a position to succeed at the ArchiMate 3.0 exam (included with the course). Participants who have taken this course will have met all of the learning requirements required for ArchiMate 3 Certification. Browse the contents of this eLearning course by clicking on a module title below that you would like to know more about. Visit our exams page to find out more about sitting the ArchiMate 3.0 Practitioner exam. In this opening module we look at what the ArchiMate standard provides to the business, as well as why it is important to the Enterprise Architecture practitioner and the organization. We introduce the key characteristics of the ArchiMate 3.0 standard and offer a brief history of the standard since its conception in 2002. Finally, we look at the custodians of the ArchiMate standard, The Open Group, and how the ArchiMate standard increasingly harmonizes with other standards of The Open Group, notably the TOGAF standard. In this module we take a look at the Open Group’s ArchiMate 3 Certification Program. We learn that it offers certification in three key areas: people, products and training courses. The certification for people program uses two levels: Foundation (level 1) and Practitioner (level 2). We look in depth at the certification requirements needed for level 1 and level 2, as well as the examination conditions and pass mark. This module introduces the basic concepts of Enterprise Architecture and the ArchiMate language. We will be looking at the purpose and benefits of Enterprise Architecture, the ArchiMate standard’s relationship with Enterprise Architecture, and the architectural domains covered by ArchiMate and how they map to the TOGAF standard. We also discuss the positioning of ArchiMate with other modeling languages, and the basic concepts of modeling. In Module Four, “Language Structure”, we begin by looking at ArchiMate’s design considerations and top-level language structure, moving on to its layers and framework. We complete the topic with studies of abstraction, concepts and notations, nesting, use of color and notational cues. In this module we will take a closer look at the ArchiMate generic metamodel, and then turn our attention to relationships. When dealing with the metamodel, we will cover Behavior and Structure Elements and Specializations. We will also study Motivation Elements, Strategy Elements, and Composite Elements. In addition to the generic elements outlined in Module five, the ArchiMate language also defines a core set of generic relationships. Each of these relationships can connect a predefined set of source and target concepts. This module covers ArchiMate’s core set of generic relationships, including Structural and dynamic relationships, Grouping, Junction, and Specialization relationships. In module seven we look at both the Motivation and Strategy Elements in ArchiMate 3. We will start by looking at the Motivation elements, which are used to model the motivations, or reasons, that guide the design or change of an Enterprise Architecture. We will begin with the Stakeholder, Driver and Assessment elements, followed by Goal, Outcome, Principle, Requirement, and Constraint, before concluding our study of the Motivation Elements with Meaning and Value. We will then turn our attention to the Strategy Elements, namely Resource, Capability and Course of Action. In this module we will explore the elements that make up the business layer in the ArchiMate Framework. The elements can be spilt into the active, behavior and passive aspects. Other elements also fall into the composite category. In this module will explore the elements that make up the application layer in the ArchiMate Framework. In module 10 we will explore the elements that make up the Technology layer in the ArchiMate Framework. In module 11 we look at the physical elements, namely the Active Structure elements ‘Equipment’, ‘Facility’, and ‘Distribution network’, the Behavior elements, and the Passive Structure Element (‘Material’). This module describes the relationships that the ArchiMate language offers to model the link between business, applications, and technology. In this module we look at the Implementation and Migration Elements and their Relationships. We define a number of Implementation and Migration elements, and study Relationships and Cross-aspect Dependencies. Viewpoints can be used to view certain aspects in isolation, and to relate two or more aspects. In this module we will address Stakeholders and Concerns, Views and Viewpoints, The Viewpoint Mechanism, Defining and Classifying Viewpoints, and Creating the View. The ArchiMate language contains the basic elements and relationships that serve general EA modeling purposes only. However, the language should also be able to support other, more specific, purposes, such as types of model analysis, the communication of architectures, and those of a certain domain (for example, the financial sector). We therefore need a means of customizing the language, without burdening it with a lot of additional material. This module is therefore devoted to the customization mechanisms in ArchiMate 3. This module will help to briefly explain how ArchiMate Certified Tools can be used to support EA modelling and analysis with ArchiMate 3. After having completed the ArchiMate eLearning course, you face the challenge of the examinations. This completes your journey to being an ArchiMate Practitioner. There are two exams: the Foundation exam and the Practitioner Exam. They need to be taken in order, and both need to be passed to attain Practitioner status. Both exams are available to take through Pearson Vue, at a testing center in your region. Pearson Vue are the authorized providers of exams for TOGAF, IT4IT and ArchiMate certification, and host exams worldwide through a network of test centers. 4PA e-Learning will provide you with a free voucher for both ArchiMate exams, on request. When you feel ready to sit the exam, just contact support or give us a call. The exam voucher is valid for 12 months from the date of issue and must be claimed within 12 months of first course access. When you have completed the course, contact 4PA e-learning support and request your free combined (level 1 & 2) exam voucher which can be used at any Pearson Vue test center. Please note that your voucher must be ordered within 12 months of your course access and two separate vouchers are provided. You can book your exam via the Pearson Vue website and pay for it using a unique voucher code. During this process you will need to create a Pearson Vue account by filling in your personal details. Why not try out a free trial module from our ArchiMate 3.0 eLearning course! 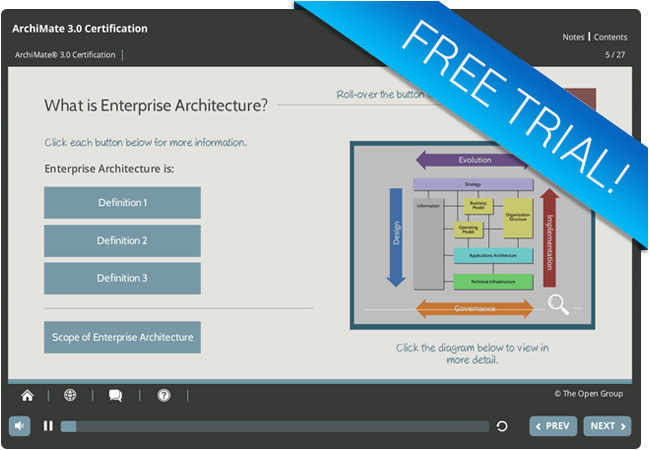 In this free ArchiMate trial module, you will learn the basic concepts of Enterprise Architecture and ArchiMate via a mixture of interactive and audio techniques to enhance the learning experience. Like the full ArchiMate 3 eLearning course, you can access this free trial module from any device whether you are at home, at work, or on the move!